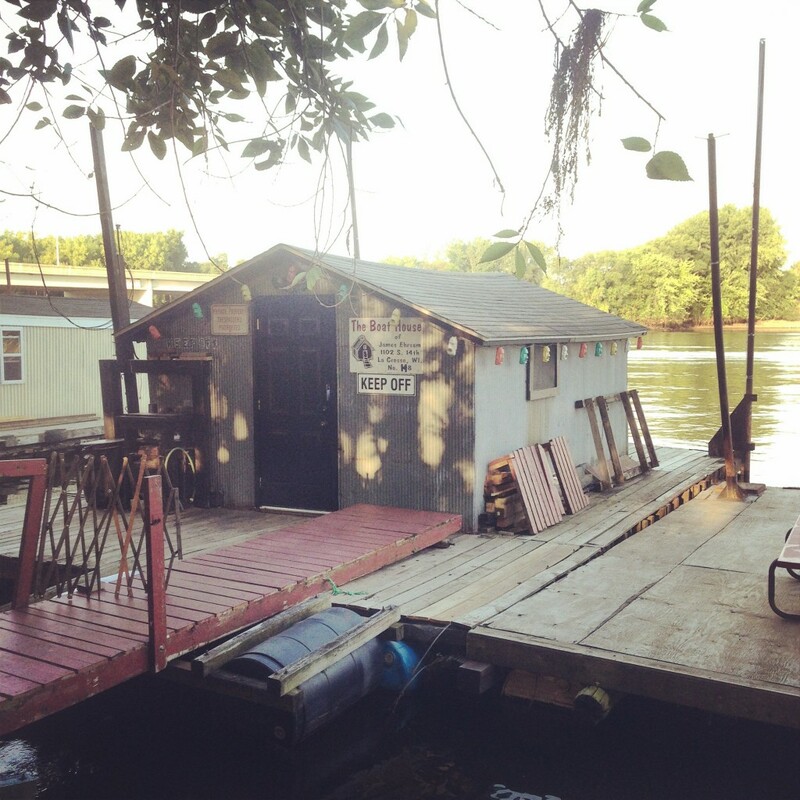 On the day before we were leaving La Crosse I met a man who’d lived in his boathouse on the Black River for 65 years. It kills me that I didn’t have the time to interview him, though we did sit for a while and watch the sunset. I’ve found it takes about three days to set up interviews when I get to a town. One day to get settled a bit, one day to meet people, and then another day in which to schedule interviews. Each of the interviews is one to one and a half hours long with lots of intense concentration and even more preparation. So two or three interviews is a long day. It was a very long day indeed with four interviews with some amazing people. The sun was setting and I sat out on the dock and enjoyed a cigar. Kai went out in Tippy for the first time and rowed around in the our little harbor. I remembered that I’d met Jared a few days earlier whose dad had lived in their boathouse since they were kids. His dad has bought it in 1964 from a lady who’d owned if for 30 years. Jarad and his sister Annie had inherited it when dad died in 2000. 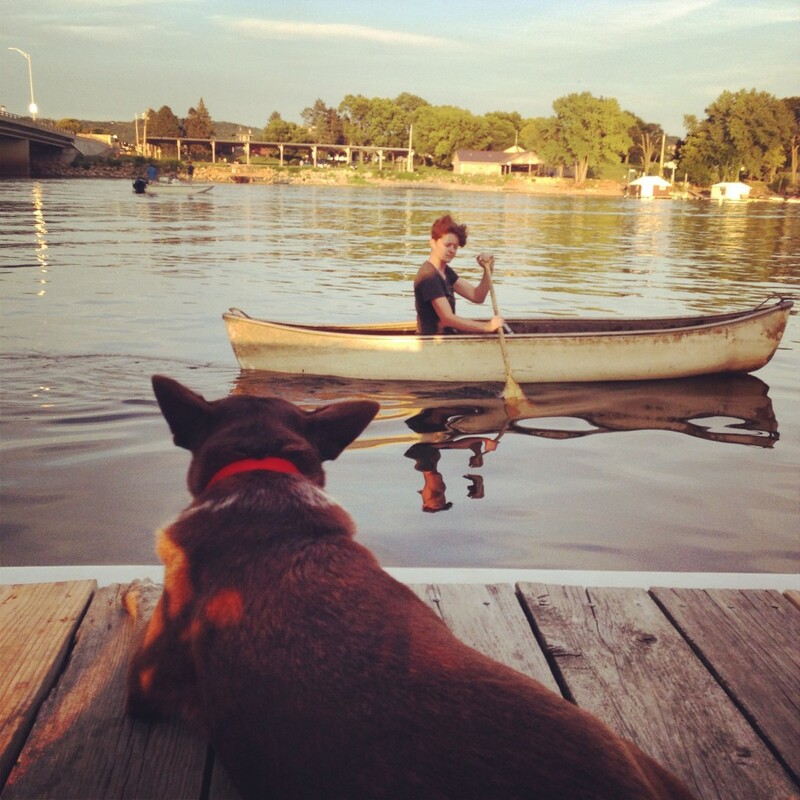 He told me that his dad was instrumental in securing the fates of the north La Crosse boathouses. 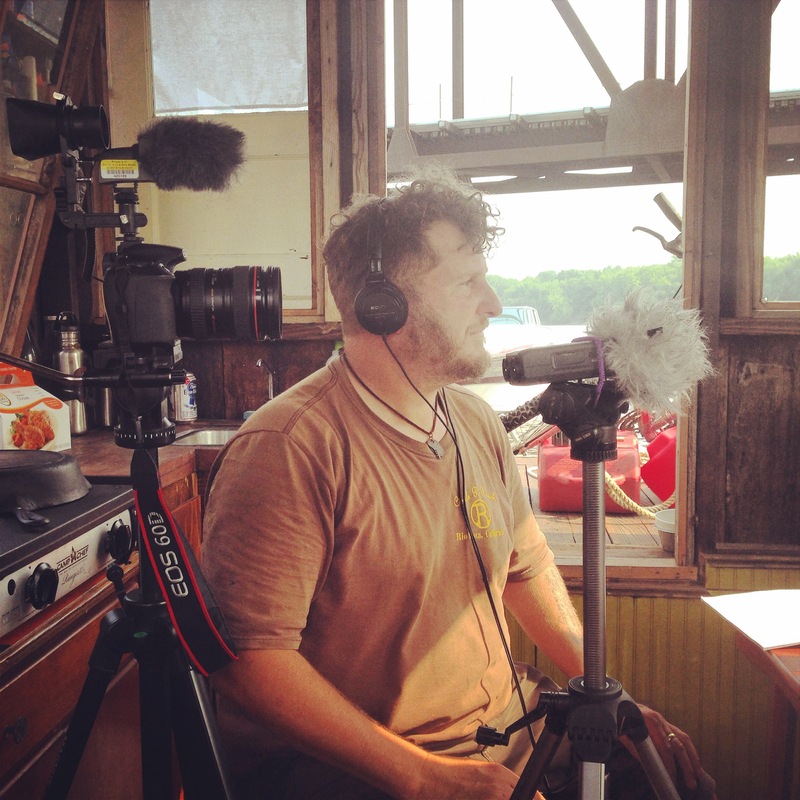 Jarad’s story was this: The boathouses were moored to a stretch of beach on the Black River in north La Crosse that was former landfill. The city was talking about developing the land in such a way that would have required the boathouse community there to move. Jared’s dad convinced the city that the land should be used for parks and soccer fields and a boat launch. Knowing that the city would inevitably want to develop the land, he worked with the local veterans organizations and the US Navy Construction Battalion (“Seebees”) to christen the park the Veterans Freedom Park and station a surplus WW2 M60 tank at the entrance, thereby ensuring the longevity of the park. I regretted that I wasn’t able to interview Jared who was easy going and funny. 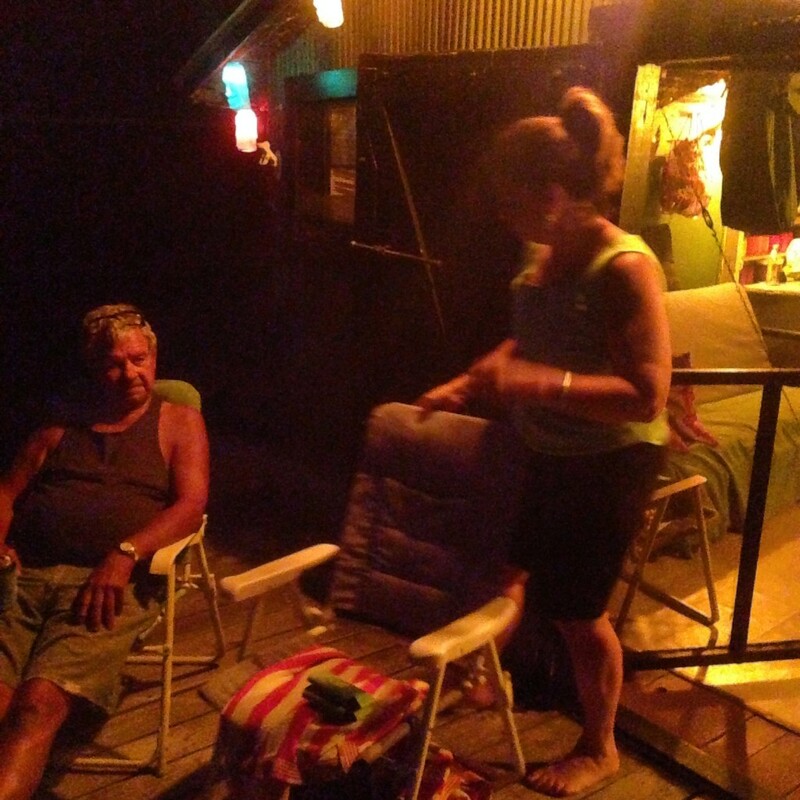 He asked as many questions about the shantyboat as I asked him about the history of the boathouse community. 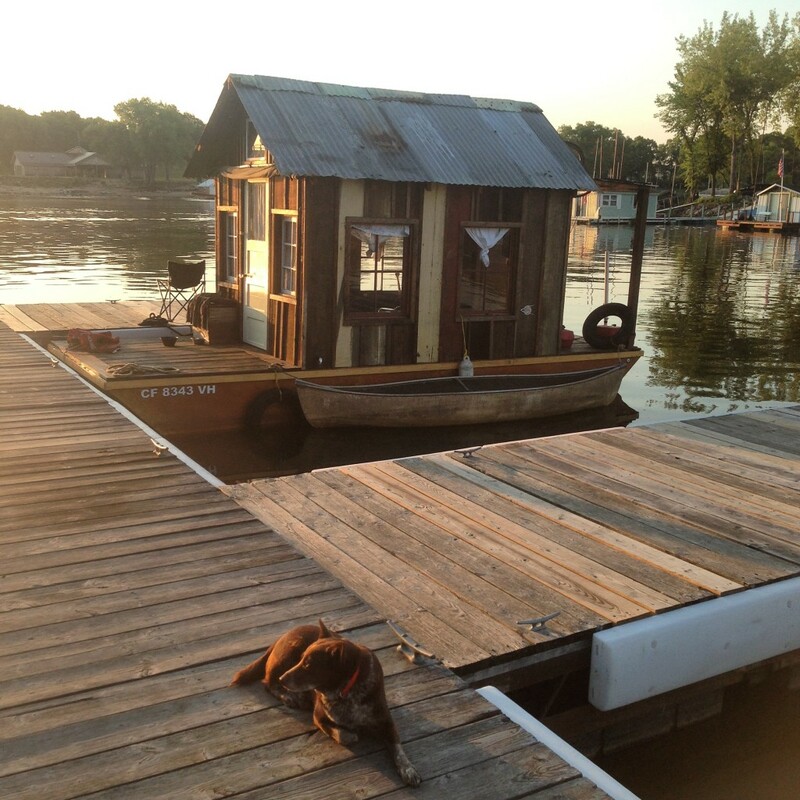 He dreamed of having a houseboat that he and his wife Laurie could live simply and off-the-grid). I watched the sunset and remembered that Jared had told me about an old fella Jim who’d lived in a boathouse across the Black for as long as he remembered. Jim had been living there when his dad bought their boathouse and they were friends. In the sunset light, I walked over the bridge and went down to Jim’s boathouse across the river. Jim was full of amazing stories. We watched the sun drop into the clouds at the horizon and turn the water fiery red. Jim told me he was there every day and evening in the season, and often days during the winter. 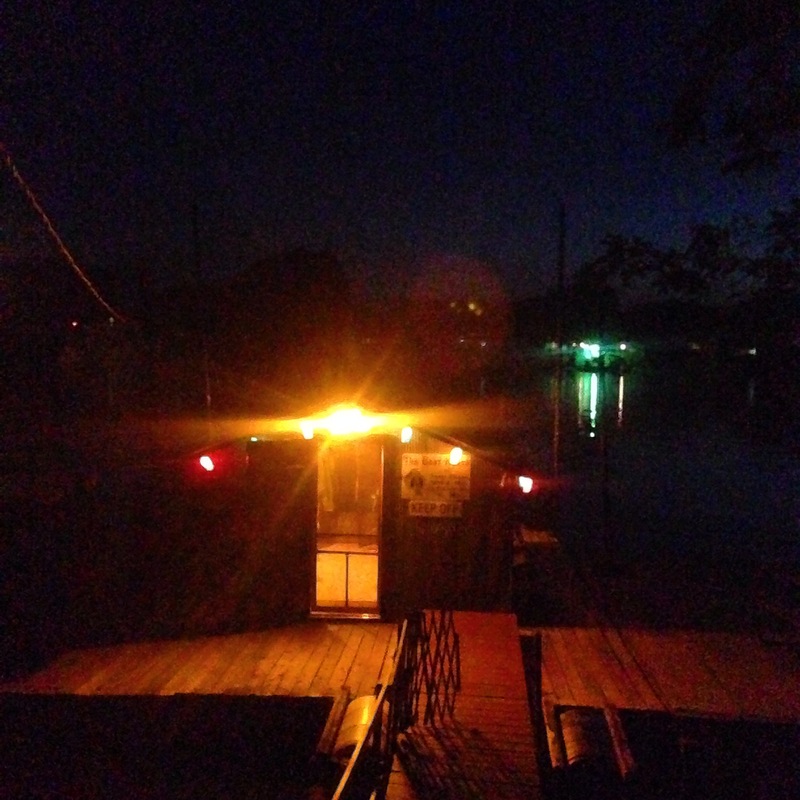 He told me his boathouse was over a hundred years old and was the first on the Black River. His dad had bought the boathouse in 1946, a few years before Jim was born. He told me he had been in La Crosse and then county and regional politics. And he had traveled all overt the world, but always loved coming home to La Crosse. He told me about new money coming into the La Crosse boathouse community. “You know, the other day, a guy came down here and asked me if there were any boathouses for sale. I told him, I didn’t know of any. “He asked me if mine was for sale. I told him, ‘Nope. I’m not interested in selling.’ He told me that everyone has a price so I should throw a number out there. “I told him, ‘That’s what it’s worth to me.’ And honestly if he’d come up with the cash then and there, I still wouldn’t a sold. What do I need money for, when I have this?” he said, gesturing at the sunset on the water.